Remember this clip from the White House Science Faire of President Obama helping 8th grader Joey Hudy shoot off a marshmallow cannon he made with the help of the folks at Home Depot? 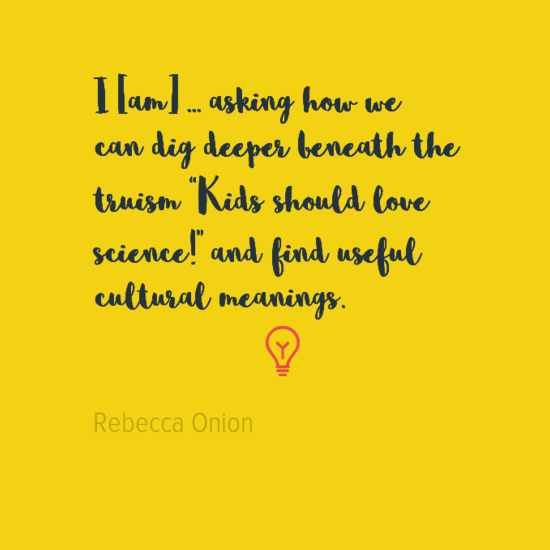 So did reporter and author Rebecca Onion, who mused about what this revived focus in informal science work meant. She set forth to study the informal science movement over the past 100 years in a series of vignettes collected in the newly-released volume innocent Experiments: Childhood and the Culture of Popular Science in the United States (University of North Carolina Press | Amazon | Project Muse (subscription required) | Google Books Preview ). 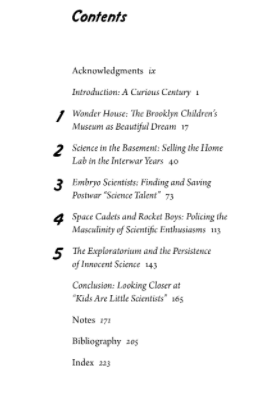 As shown in the the table of contents below, her research takes her on remarkable journey. Chapter 1 takes her to the Brooklyn Children’s Museum between the World Wars, with descriptions of children (mostly white, mostly middle-class, mostly male) learning classification and tree identification but ultimately leading to a group of boys running the museum’s wireless system. 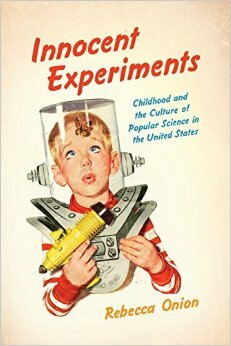 Chapter 2 studies the rise of chemistry kits and the ways in which the “naughty” behaviors of those who used them (again, mostly white, middle class, and male) began to be seen not as mischievous but as scientific. Chapter 3 looks at the movement to identify and showcase scientific talent (again, with males as key figures and female budding scientists as those guided by males, dating male contestants, or visiting the Hope Diamond), with a desire to find prospective scientists who also met society’s ideals for sociability. Oh, and most of them, just to be clear, were mostly male, mostly white, and mostly middle-class. See the pattern? Chapter 4 delves into the role of science fiction, particularly the worlds created by Robert Heinlein. (Teachers and librarians, beware: he’s got harsh words for both of these traditionally female-dominated professions, though some of his harshest words were reserved for his editor — and Newbery Honor awardee Alice Dalgleish). Chapter 5 looks at the early years of San Francisco’s Exploratorium and wonders aloud if, just as with the male chemistry kits, the movement to learn science through exploration is more about play than about scientific acquisition. Thankfully, gender plays less of a role here, but the pedigree of the Exploratorium’s founder makes for a good jeopardy question, as it is none other than the brother of Robert Oppenheimer of the Manhattan Project. For decades, there has been an intent to develop more scientists through interventions like museums, science competitions, and even science fiction. Has it worked? To what extent? What is the difference between “cool” science (think of the hair-raising Van de Graff generators or the Diet Coke and Mentos explosions at a Maker Faire) and the day-to-day work of scientists? Does interest in “cool” lead to professional engagement? What is the missing piece there? What pieces need to be in place in order for children to not only experience science but develop meaningful/rigorous scientific understanding? Over and over again, there are events in American history that are that generation’s Sputnik. (Think, for example of President Obama’s 2011 State of the Union speech, in which he referred to the need for more research and development by calling it “our generation’s Sputnik moment“) Do we succeed in rising to the challenge today? Historically? Today’s maker movement has been accused of catering to an audience that is primarily male, well-educated, and middle class, the same population Ms. Onion refers to repeatedly in movements of the past. How do we get past this as the primary audience, 100 years later? Do we have the right players working with young people to develop scientific thinking, understanding, processing, and reasoning? How would we know that we were successful in this way? One of the implicit themes of Ms. Onion’s book is that perhaps what we’ve labeled as informal or out-of-school science is actually play. Yet politicians and decision-makers are often far more committed to spending money on science/STEM/STEAM/STREAM/STREAMS/HAMSTER (!!) than on play. Should we try to change the narrative? What are the risks/benefits of doing so? All in all, this has been one of the STEM/maker books I’ve read lately that has challenged my thinking the most. I highly recommend it. You can get started reading it below, as much of the first chapter is available via Google Books.